Standard test for measuring the hardness of coatings. The calibrated slip-on weight with special cutter is positioned on the test specimen for a set period of time. The length of the indentation on the coating is an indication of the hardness of the surface. Mandatory test in Qualicoat, QIB and GSB accredited laboratories. The test shall be carried out at a temperature of 23±2°C (73±1.2°F)and a relative humidity of 50±5%. The coating to be tested must be smooth and clean. Use the level gage to ensure the test panel is at level on the testing surface. indentation will be visible at the gap in the middle. start T1 on the timer. After 30 seconds remove the Buchholz Indentation Tester from the surface and start T2 on the timer. While removing be careful not to apply any pressure to the indenter. The special cutter is a sharp object. Be careful when using it. Though robust in design, this instrument is precision-machined. Never drop it or knock it over. such as a wire brush or abrasive paper. This may cause permanent damage. 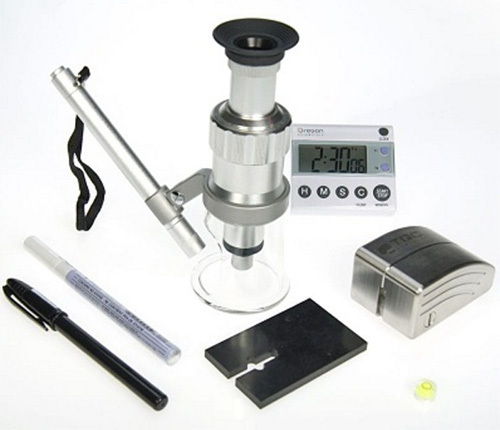 The set consists of a calibrated slip-on weight with a special cutter, an illuminated microscope, a level gage, a digital dual timer, two markers with template and three AAA batteries.